Opening sponsorship spot is a clip from Ehren Ziegler’s spoof video, “Your Lightsaber and You.” Watch the whole thing at Comedy Central here. FACT OR FICTION: Can you pick out the confirmed fact from the tall tales? This week’s host challenge involves companions, operations, and James Ohlen. “Return,” new cinematic by Blur Studios. “Choose,” new trailer from Origin.com. Jennifer Hale FTW! E3 2011 Game Features Preview: cinematic storytelling, space combat, operations, warzones, ahhhhhhhh! “Eternity Vault” trailer. End game! They said end game! 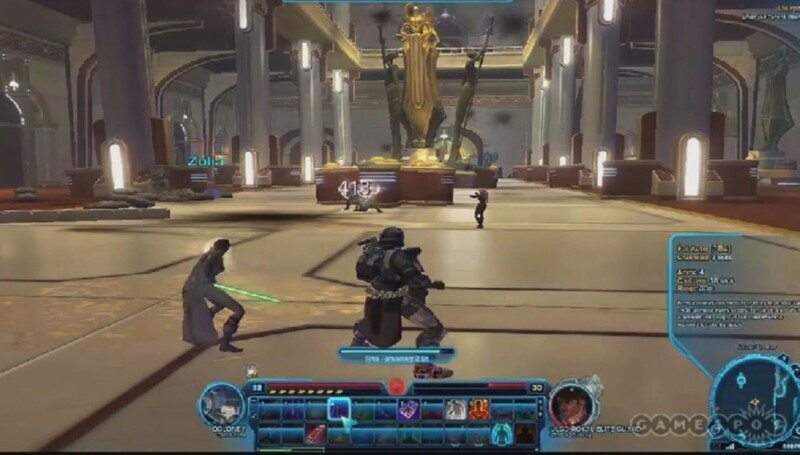 “E3 2011: Tatooine Walkthrough.” The ever-affable Dallas Dickinson chats his way through questing and combat in Tatooine. Excellent depiction of how it feels to play the game. Live coverage: Daniel Erickson Tatooine gameplay demo plus Q & A.
GameTrailers: James Ohlen Tatooine gameplay demo. Gamespot: Daniel Erickson Alderaan gameplay demo. Other E3 Reveals Sources: BioWare Pulse interview with Casey Hudson and Dallas Dickinson, Machinima interview with Daniel Erickson, Darth Hater interview with Daniel Erickson, Newsarama interview with James Ohlen, Gamespot interview with Daniel Erickson, Fureur interview with Daniel Erickson (translation thanks to KC-Cullen), IGN interview with Daniel Erickson, Machinima interview with James Ohlen, TORWars tweet, David Bass tweet, Stephen Reid Dev Tracker post. Fri Update 6/10: Razer Peripherals, Contest for Razer game packs ends June 14th. Details here. Facebook group chat. Join us at the Corellian Run Radio page in Facebook. Curse Gaming interview with Ray Muzyka and Greg Zeschuk. G4 TV: Adam Sessler and Candace Baileys talks to Daniel Erickson. First Star Wars game for Xbox’s Kinect. David Bass’ personal blog entry about E3. SITH OR JEDI? We find out which path we walk in real life with The Test of Promotion. Responses to macro discussion from Episode 25. Check out the discussion on our forums here and here. Glen Speed and Sunny Ravencourt for leaving us positive reviews on iTunes. Autocron from the Sith Happens guild and Joe from Chapel Hill, NC for sending in call-in questions. Jeff Hollis and David Moore from TORWars for representing us at E3 and interviewing Daniel Erickson on our behalf. Daniel Erickson, for being such a gentleman. And also for being Daniel Erickson. Don’t miss his beefcake shot here. On the dialog wheel I noticed on the game play videos from E3 that the circle to the left of the choices had a blue or red symbol in it when they highlighted different choices. Not a fist or olive branch but they seem to have the same mechanic. Nice work witch Podcast. I’m from Poland and I have to say that I’m stepping on thin line of been throw from work because I’m listening all of yours Podcast. Thought I would post this really funny link for Roxanne, regarding ME3 and homosexual relationships! @Suxhi As far as I can tell from watching the videos, the blue and red symbols pop up only the conversation choices which are actually going to affect your Dark and Light Side points. If it’s just a run-of-the-mill exchange, you don’t get any indication from mousing over. @Airia That link is great, thanks for pointing it our way. Great show once again. There was so much information that Bioware gave us, even if the EA press conference was slow start. I think Bioware left everyone wanting the game release by the end of week. @Kathy: I so agree about questions that were answered. They revealed some story details about choices the Trooper needs to make, and no I am not going to post the spoiler. Yeah, I remember that Trooper bit! Just to be clear, Jennifer was trolling, and it was grand. I wish I could read this thread for context, can’t seem to find it, but I don’t really get the sense that Jennifer is joking here. Didn’t she write Anders in DA2? I feel like that is pretty compelling evidence that she’s in earnest.